All the products you’ll find on FirewoodFund.co.uk have been sourced from British woodland. We take pride in only selling sustainable logs that are sourced from responsibly thinned woodland. That means using wood from trees unsuitable for the furniture industry which are removed to create more light and space for surrounding trees to grow and thrive. The source of the logs is stated on the product (British origin). A moisture content of less than 25%. The log length is stated and controlled (standard length is 25cm, but others can be declared). Load volume is illustrated, for example in metre cubed, either as a ‘stacked’ volume or ‘loose fill’. Whilst buying imported wood may seem like value for money, it comes with negatives. It creates a huge carbon footprint as crates of logs are unnecessarily transported thousands of miles across Europe by trucks fuelled by diesel. 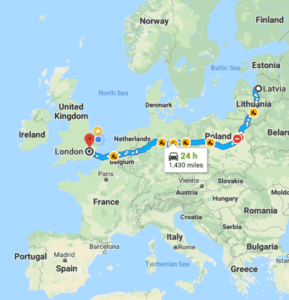 Many logs come from Latvia, which is 1,500 miles from London, for example, and it takes at least 24 hours to cover that distance in a vehicle. It’s much harder to trace the origins of imported firewood and it is more likely to come from mass culled woodland, destroying the natural habitat for wildlife. Unfortunately many retailers do not pay enough attention to the origin of their wood, meaning some retailers are encouraging the unnecessary destruction of forests. Importing firewood increases the risk of new diseases being introduced to British woodland. With the United Kingdom being an island nation, our forestry is fairly isolated and vulnerable to foreign disease. Our ash trees are under particular threat from pests and disease so we must all do our bit to protect British woodland. How can you tell if logs on sale are imported? 1. Before making a purchase look to see if the origin of the wood is stated. If not, ask where the firewood comes from. 2. 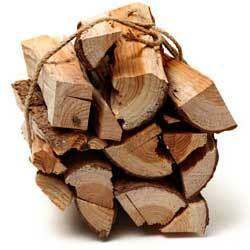 Imported bulk firewood is often supplied in wooden pallet crates with the logs neatly stacked. Pallet crates are often sold in 1m3 or 2m3 volumes. 3. Packaging is unbranded, making it harder to trace the origins of the wood. 4. If the species is 100% silver birch or alder, it’s likely to be from Europe, as these are common species exported to Britain. Why are logs from FirewoodFund categorised as sustainable fuel? After a woodland is thinned, it is left in a condition that enables trees to flourish and produce more logs. Burning logs is much better than fossil fuels because trees can be replanted, whereas fossil fuels like gas and coal take millions of years to form. Why do we still use non sustainable fuels? In a word – convenience. But at what cost? At FirewoodFund we believe that homeowners should be doing what they can to reduce reliance on fossil fuels and heating their homes using sustainable fuels. The great thing about logs is they can be sourced from branches of trees when they get too overgrown and require felling. This means once a tree has been trimmed back it can continue to thrive and potentially produce more logs in the future. Another major benefit is more trees can be easily planted, providing us with more logs within decades. In the right conditions, for example, an ash tree can grow and reach full size within 16 years. On average an ash tree can then last for 120 years before it dies. As well as the environmental benefits of logs as a renewable energy source, using a wood-burning stove has other benefits too. Generally, a modern family spends most of their time in the living room, where you’d usually find a wood-burning stove, yet families heat every single room, even those rooms not in use. A wood-burning stove means you can focus on heating the room(s) in use. Stoves are also incredibly efficient. Compared to an open fire, which is only 15% fuel efficient on average, a stove is an impressive 80% fuel efficient – maximising heat output and reducing the rate fuel is burned. Shop with confidence. This website is encrypted to keep your information safe & secure.